It's very frustrating when you have tomato flowers but no fruit, or big, beautiful tomato plants but no tomato flowers at all. Thankfully, most of the time you can get your tomatoes producing with a little extra TLC. 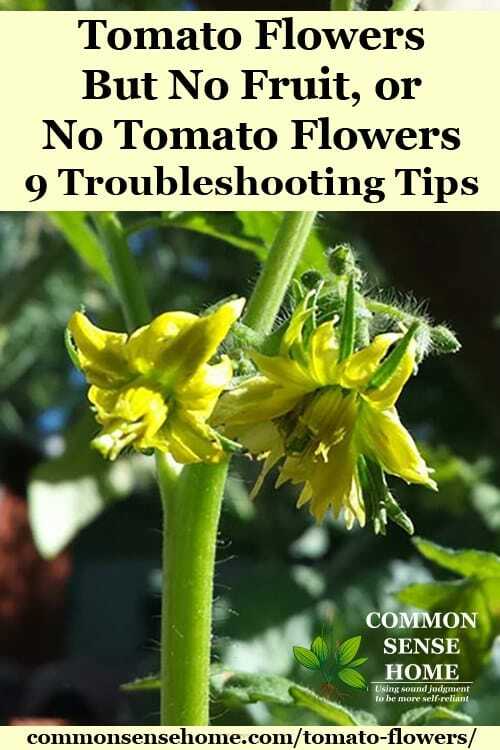 In this post, we'll look at two tomato flower problems – no flowers at all, and tomato flowers but no fruit. So you have these beautiful, green, lush, tomato plants but no flowers – what gives? There are several factors that can keep your tomato plants from flowering. Tomatoes are heavy feeders, and require nitrogen, phosphorus and potassium, plus many micro-nutrients. To produce flowers, they need less nitrogen and more phosphorus. The University of Missouri recommends a fertilizer low in nitrogen, high in phosphorus and with a medium to high amount of potassium.Try using a fertilizer such as Jobe's Organic Tomato Fertilizer to help promote flower production. You might also consider a foliar spray like Feed the Leaf Organic Blooms. When you have rampant green growth from too much nitrogen and no flowers, you may want to prune some of the leaves and remove the suckers. (Do not prune determinate plants.) This way the plant can focus its energy on producing flowers and not feeding the leaves. Tomatoes are native to subtropical Central America. They evolved to need it warm (but not too warm) to form their fruit . A temperature range of 65 to 75ºF (18-24°C) is ideal. During extreme heat, the tomatoes will stop flower production. Be patient, and when the weather cools down a little, your tomatoes should start flowering again. Make sure you keep them watered and fertilized while waiting for the temperatures to fall. Tomato plants need about 1 to 1 1/2 inches of water each week to fruit, according to Ohio State University. The key to healthy tomato plants is to never let them dry out, or get flooded, but to keep the soil evenly moist. You can help your plants retain moisture by adding organic mulch and compost around the base of the plant. In addition to variety, the type of tomato plant you have will play a role in production as well. Determinate Tomato Plants are called so because they grow to a determined height. They are short, bushy and known to produce early in the season. Once fruiting is done, it's done – the plant will set no more fruit. Indeterminate Tomato Plants grow to an undetermined height (mine have grown over 10 ft!). They are long, leggy, and may set fruit until the first frost. If you have a determinate tomato variety, your tomato season may already be over. If you have an indeterminate variety and you are not seeing flowers, or are seeing flowers but no fruit, continue reading to help determine the cause. Fruiting vegetables, such as tomatoes, require six-eight hours of sunlight per day to thrive and produce fruit. Less light may equal production issues, such as no flowers or flowers but no fruit. Container plants can be moved to a sunnier location, but if you garden doesn't get enough sun, fruiting plants will be less productive. 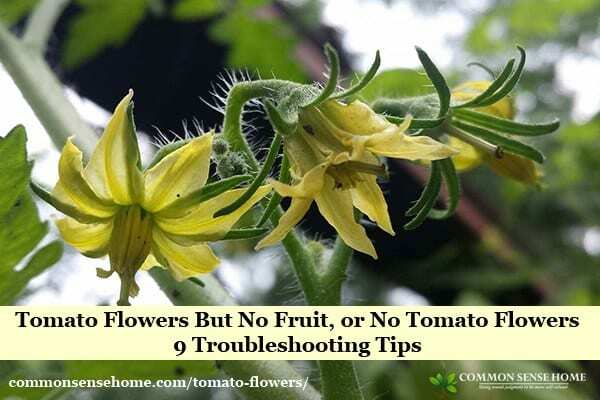 What if your tomato plants have plenty of flowers, no visible health issues, but no fruit? Tomatoes are self-pollinating, meaning they have both the male and female parts. This means that they may be able to pollinate and set fruit even without bees, but sometimes things go awry in the reproduction department. Some things we can fix, some we can't. 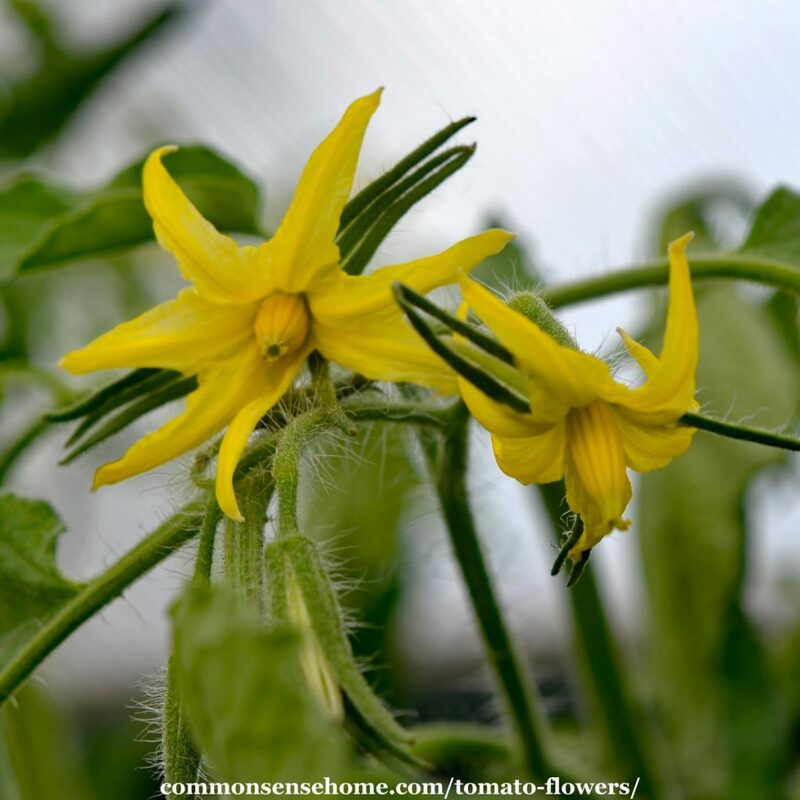 Here are some of most common causes of tomato flowers but no fruit. Air temperature is an important factor in the production of tomatoes, which are particularly sensitive to low night temperatures and extremely high temperatures. Blossom drop can occur in early spring when daytime temperatures are warm, but night temperatures fall below 55°F. This phenomenon will occur during the summer as well, when daytime temperatures are above 90°F and night temperatures are above 75°F. For high temps, a shade cloth may be used to block some of the afternoon sun and beat the worst of the heat. For cold temps, consider red plastic mulch sheeting (this can go over organic mulch and be reused for several years). You might also find a grow tunnel or floating row cover boosts temps enough to promote fruiting. Tomatoes reproduce by their pollen falling from the stamen and pollinating the stigma. Generally this pollination happens by wind, movement and vibration of a bees wings. High humidity can impede this this process by making the pollen too wet to freely transfer to it's destination. If you live in a climate with high humidity, you can help pollinate your tomato plants by gently tapping on the flowers or flower stems. Another option is to gently brush pollen from one flower to another with a small paintbrush. Remove some of the foliage, such as suckers. Don't plant your tomatoes too close. Space determinate varieties 12-24″ apart and indeterminate varieties 36-48″ apart. Don't plant next to a building or structure. Instead, plant your tomatoes where they have open air on all sides. Too many flowers on a tomato plant will cause competition for nutrients among the flowers. As a preservation method, the tomato plant will automatically abort and drop flowers. After your plant goes through a fruiting process, this problem should correct itself without intervention as long as the soil is good. If in doubt, try a fertilizer such as Jobe's Organic Tomato Fertilizer or Feed the Leaf Organic Blooms foliar spray, as mentioned above. Don't Give Up on Homegrown Tomatoes! There can be a learning curve to abundant tomato production, but the effort is worth it. Fresh picked tomatoes are one of the best treats available from the home garden. Questions, comments or some tips of your own you'd like to share? Please leave a comment below. 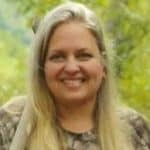 Amber Bradshaw of My Homestead Life. Originally published in 2017, updated in 2018. Please advise readers not to use peat products as it is a non-renewable source. Other products such as perlite and azomite are also not environmentally-friendly as they have to be extracted by mining which is one of the most polluting human activities. Home-made compost is the best way to amend existing soil. I like Espoma Tomato-tone Organic Fertilizer. The bag recommends applying every two weeks. Tomatoes are heavy feeders, and require nitrogen, phosphorus and potassium, plus many micro-nutrients. To produce flowers, they need less nitrogen and more phosphorus. The University of Missouri recommends a fertilizer low in nitrogen, high in phosphorus and with a medium to high amount of potassium.Try using a fertilizer such as Jobe’s Organic Tomato Fertilizer to help promote flower production. You might also consider a foliar spray like Feed the Leaf Organic Blooms. Please see also points 1-5 “Common Causes of Tomatoes Not Flowering”.